Neither of us are writers at heart, so each year when it comes time to reflect on the past year and create a post to share with all of you about the upcoming Ref4Rett season, we find ourselves stuck on what to say and how to say it. We are not looking for pity or sympathy but feel that it is important to continue to share our journey, our accomplishments and spread awareness. Today marks the second anniversary of Elle’s diagnosis and the day that Rett syndrome became an everyday part of our vocabulary. Our first year was about grief and loss, the second year about fear and a lot of “don’ts” and this past year has been about having Rett syndrome hit us square in the face – what it really means, the impact it can have and how each day is truly unpredictable. This year was a year full of ups and downs. In April, we celebrated the incredible launch of the Canadian Rett Syndrome Registry, which we are really proud to have been able to fund a large portion of the development of this Registry through all of our fundraising efforts. We are also so thrilled that the Ontario Rett Syndrome Association (O.R.S.A.) has created the Hope Fund. This fund exists solely for research. One hundred percent (100%) of all of these dollars will go to Rett syndrome research to find a cure and/or treatment for Rett syndrome. The first fifty thousand dollar grant that will be issued this year is solely possible because of the efforts of Ref4Rett and the tremendous support that we have received from everyone. Despite all of those great celebrations, this year we also learned how truly hard it is to be a parent of a child with a syndrome that many (not even highly qualified doctors) are not really knowledgeable about or truly understand. Throughout this past summer, we saw a glimpse of what life would be like if Elle suddenly lost the ability to walk and talk, and the terror that was in her eyes when she was going through the loss. We learned how truly vulnerable we are and the true meaning of being helpless; when you see your daughter disappearing before your eyes and not knowing what do about it. We also saw the extraordinary commitment of the doctors who we’ve had the honour of meeting in the Rett community who responded so quickly to our cries for help; trusting that we really do know Elle better than anyone else and who truly listened to our worries. It has been a year, where Elle has transitioned in her appearance from being a little girl to a big girl of 7. Being a “big girl” has brought along with it higher expectations of what is “proper” or “normal” behaviour in public. We have started to notice more looks from those around us who do not realize that she has Rett syndrome. She is no longer just a “cute little girl” who is just being “cute”, but a 7 year old who makes noise at times where it maybe inappropriate; drawing looks of disapproval from those who do not understand. We as parents in turn feel the pressure of “why can’t you keep your kid quiet”; when all we really want to do is shout out “SHE HAS RETT SYNDROME AND WE ARE JUST VERY GRATEFUL THAT SHE CAN TALK”. Despite the busyness of life, we continue to be determined to both raise awareness and funds to support on-going research. It is for that reason that we reach out to you today. In the last two years, Ref4Rett has raised over $100,000 in support of O.R.S.A., all of which has been dedicated to research. Moving forward, all of the Ref4Rett funds will continue to be dedicated to research and distributed via the Hope Fund. As in the past two years, we continue to receive tremendous support from the Paris Mounties (OHA Jr.C). On January 31, 2015, we will be hosting the 3rd Annual Ref4Rett Event at the Brant Sports Complex in Paris. This year’s event is set to be bigger and better and will feature two hockey games. 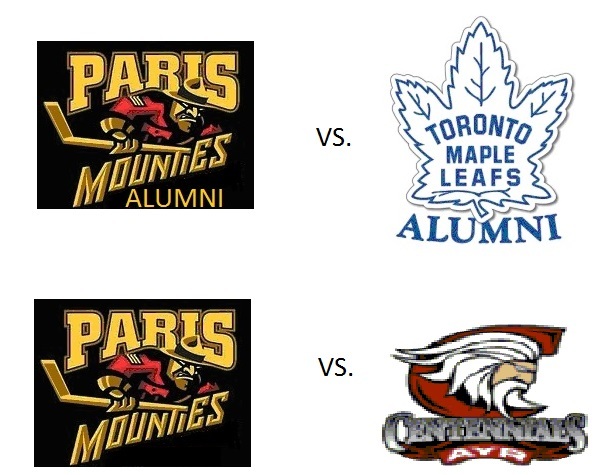 The first game that starts at 5:30 p.m. and will feature an alumni game between the Paris Mounties Alumni and the Toronto Maple Leafs Alumni. For one lucky fan there will be the opportunity to coach the Leaf Alumni team through an online auction. The highest bidder will win the opportunity to sit behind the leafs bench for the entire game and be in the dressing room with the team between periods. Visit www.ref4rett.myevent.com and click the “Be the Leafs Coach” tab to place your bid. The second game starts at 7:30 p.m. and will be the last regular season game between the Paris Mounties and the Ayr Centennials. Tickets to the event are $20 each and include admission to both games. Tickets are available at the following locations: Legends Tap House & Grill, during the Paris Mounties Home Games at the Brant Sports Complex, or by emailing us at ref4rett@gmail.com. Along with the great hockey, there will be an autograph session with the Leafs Alumni and a silent auction. Our goal this year is to raise $50,000.00 for Rett syndrome research. As we plan for our event, we are currently looking for sponsors, silent auction items, or volunteers to work at the event. If you or someone you know is interested in any of these, please contact us. Thank you for the continued support, well wishes and prayers, they are all so truly appreciated.